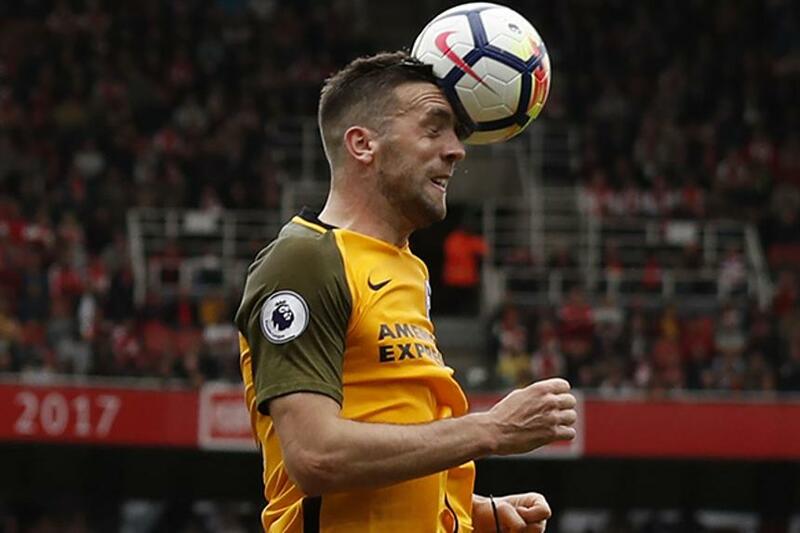 In the final of a five-part series on players to have made an early mark in 2017/18, Adrian Clarke profiles Shane Duffy, a dominant defender for Brighton & Hove Albion. We knew Brighton would set themselves up to be defensively solid on their return to the top flight, but the quality of their off-the-ball work has still exceeded expectations. It is the outstanding centre-back partnership of Lewis Dunk and Duffy that has really caught the eye. Building on a successful first season together in the Championship, where their clean-sheet ratio stood at a fantastic 46.4%, the pair have continued to inspire shutouts in the Premier League. Brighton have claimed four from their 11 matches thus far. Dunk is arguably the more accomplished defender on the deck, but his Irish counterpart is without question the stronger in the air. In fact, Duffy is the best defender of aerial balls in the Premier League. Thanks to his expert positioning and a fierce desire to outjump his opponents, no one in the competition has won more headers or made more headed clearances than him in 2017/18 ahead of Matchweek 12. When crosses or long punts are put into the box, the ball is drawn to him like a magnet and, inside the opposition box, the 25-year-old has also had five headed efforts on goal. Brighton’s tactical approach relies heavily on Duffy’s attributes. Accepting his side will be unable to control many PL contests through possession, manager Chris Hughton prefers his back four to defend deep, and almost always narrowly. This counter-attacking style affords opponents the chance to put in many crosses and long balls into their penalty area. On average Brighton field 22 crosses each match. But that often plays right into Duffy’s hands. He will happily repel the danger. Hughton’s reliance on his central defenders allows Brighton to avoid suffering too much from the pressure exerted upon them by the opposition, even if they spend more time inside their own defensive third (32% per match) than any other team. It is a testament to Brighton's ability that only Manchester United and Tottenham Hotspur have conceded fewer goals from open play than their six. Duffy is an old-fashioned centre-back who relishes the physical battle with strikers. There are no frills to his game. He is simply excellent at defending the 18-yard box and clearing his lines. If he and partner Dunk can stay fit and free of suspension, Brighton’s hopes of staying up will be greatly enhanced. They are invaluable players.